Besides research and educational activities, the major thrust of the division is to provide routine clinical diagnostic services for cancerous and non-cancerous patients referred to our institute. The diagnostic services includes are analysis of various tumor markers, thyroid and hormone profiles which are performed on Chemiluminescence System Cobas e 411Immunoanalyser. 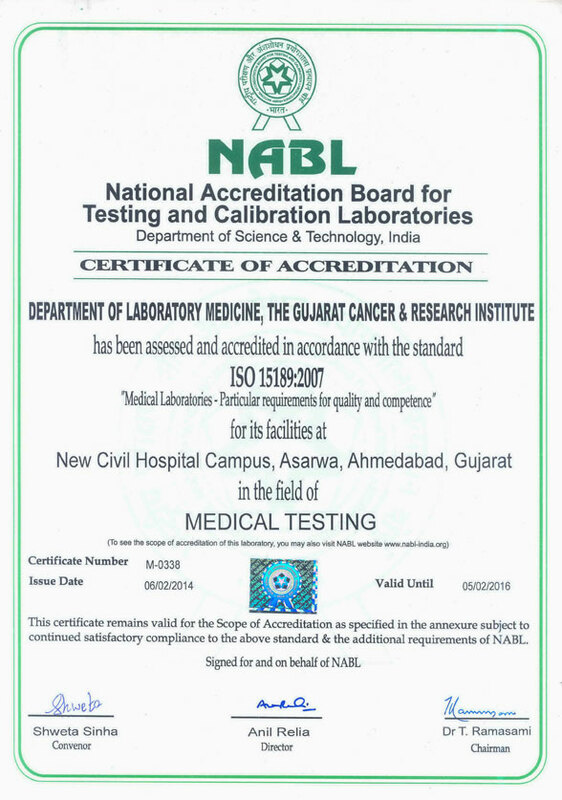 The Division is NABL Accredited for Special Biochemistry Investigations. At the division, clinical evaluation of total 23 different parameters are being routinely carried out to aid diagnosis and treatment of cancer patients as well as patients with endocrine disorders. The division participates in various academic activities of the institute; weekly seminars of the department, enrolment of PhD students and MSc/MPharm Dissertation students, and Summer Training Programme for MSc/BSc students. Postgraduates from various universities of Gujarat are enrolled for dissertation work and undergraduates as observers for Summer Training Programme. Moreover, the division is actively involved in recently started MSc Cancer Biology course. Lectures and practicals, for students of MSc Cancer Biology are being organized by the division. The division participates in Conferences and CME organized by the Cancer Biology Department. Biomarkers are central to detection, diagnosis and management of cancer and hold vast potential for the development of effective new personalized cancer therapies. For this, it is necessary to define the cumulative genetic events and how genes work, particularly, genomic instability, genes involved in deregulation of signal transduction, transcription factors, cell cycle regulatory and DNA damage and response pathways, and evaluate their clinical relevance. At present, the research activities of this division are focused at studying the clinical relevance of multiple biologic markers by fully exploiting the genetic machinery involved in the initiation and progression of cancer along with tumor micro environment us in grecent technologies. In breast and oral cancer, research revolves around the vital role of Jak-Srcs-Stats and cytokine signal transduction pathway mediated by EGFR, DNA damage repair pathways, stem cell markers, their interaction with microRNAs, and sub sequently it srelevance for patient management. In colorectal cancer, the role of Fas receptor and its ligand, Sparc receptors, vitamin D receptors, Thymidine synthetase and ERCC-1 gene polymorphism will be exploited. The information gained will be valuable for a more reliable estimate of tumor behaviour to predict patients’ prognosis, identify individual patients who are at a low risk or high risk of relapse, detection of micrometastasis and monitoring the course of the disease. In thyroid malignancies, the role of cytokines involved in pathogenesis of the disease is exploited. Subsequently statistical analysis of the data is performed.